← 84. Lundin. 31 Aug 2018. The “Committee Only” Car Park sums up why Golf has to change to survive. Portlethen, about 7 miles south of Aberdeen, on the A90, is one of the fastest growing areas in Scotland over the last 30 years. When the golf course was opened in 1989 the population was recorded as 1500, yet in 2011 it was over 7000 – no doubt driven by the North Sea oil boom. With the opening of the substantial Aberdeen bypass imminent, Portlethen continues to grow, albeit the area is also suffering from the collapse in oil prices in 2015. The welcome wasn’t warm at Portlethen – Beware of any clubs with “Committee Only” anything. No wonder some clubs are struggling. The course, designed by the renowned Donald Steel, along with the substantial clubhouse, seems apt testimony to the ambitions of the area. Yet somehow, for me, the course fails to deliver on the initial optimism demonstrated by the designer chosen. When asked what I thought of Portlethen, my answer was “It’s OK”, which sums up my experience. The 4th at Portlethen, one of the best holes. It’s a generous parkland setting, and after a few ordinary holes, the 4th tee provides an excellent view of the par 5 signature hole; after a good drive I hit an excellent 3 wood over the pond guarding the green – my best strike of the day – which caught the top of a large tree and ended in the water. The 5th is also a picturesque water featured par 3. After those highlights, I thought the course somewhat fell away in quality, other than the superb 15th, the SI 2 par 4, which also had a green fronted by water. The difficult par 4 15th at Portlethen. 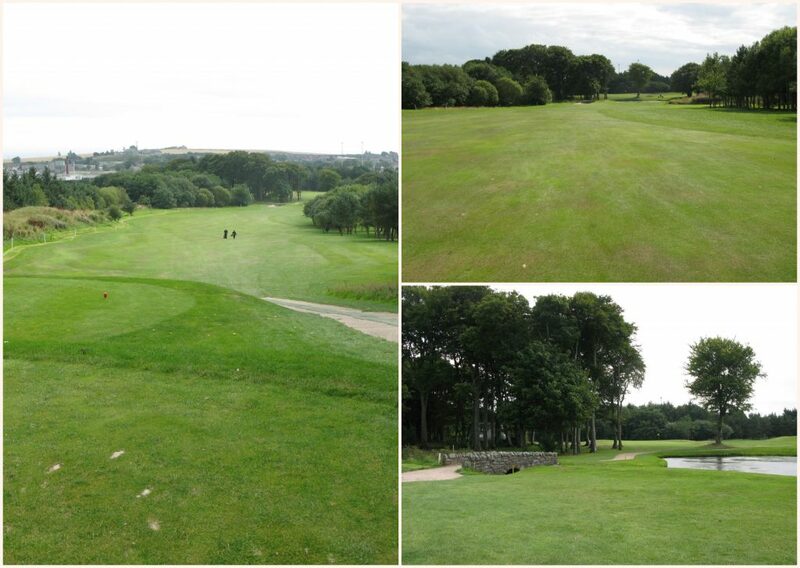 The course was in reasonably good condition. But it was the lack of welcome which stuck with me. 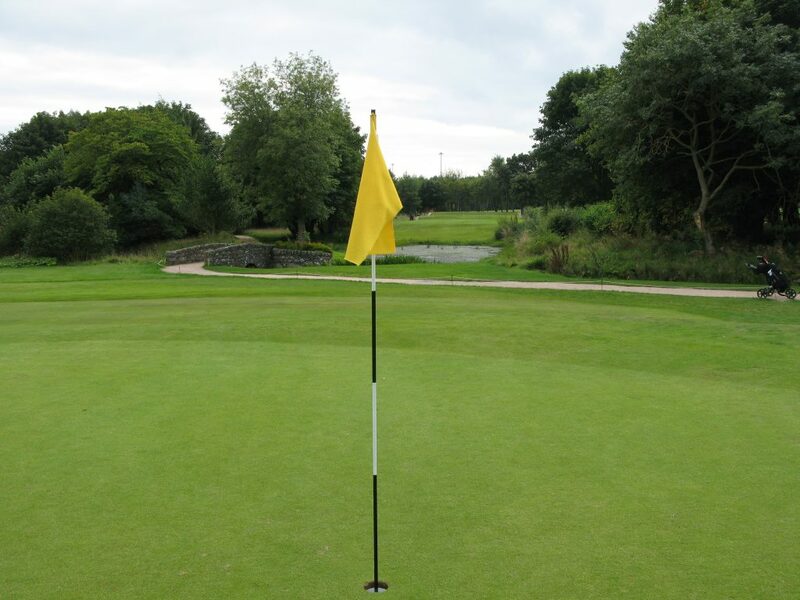 As a www.teeofftimes.co.uk customer I was advised I would be paired together – not a problem, but expressed in a manner that made me feel a second class citizen. However, shortly thereafter, I was advised I could play on my own as there was space on the tee! Nevertheless, my round was very slow, and it was clear that people in front of me were determined not to let me through, even when there was space in front. The aesthetic 5th at Portlethen, a short iron par 3. 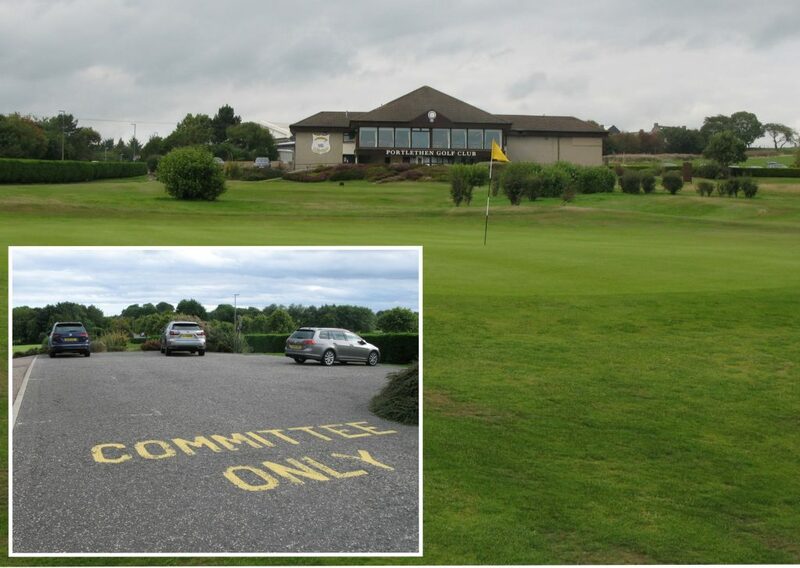 This seemingly unfriendly approach by a couple of players cannot, of course, be judged representative – however, when I saw the size of the “Committee Only” car park, this seemed so representative of the welcome I’d received. My overall assessment was that Portlethen was about a 3 for value. The club’s website makes a big sell of “The Portlethen Experience” – but I must say, for me, it just felt a little bit pretentious overall. On the day I played well for my net 71. 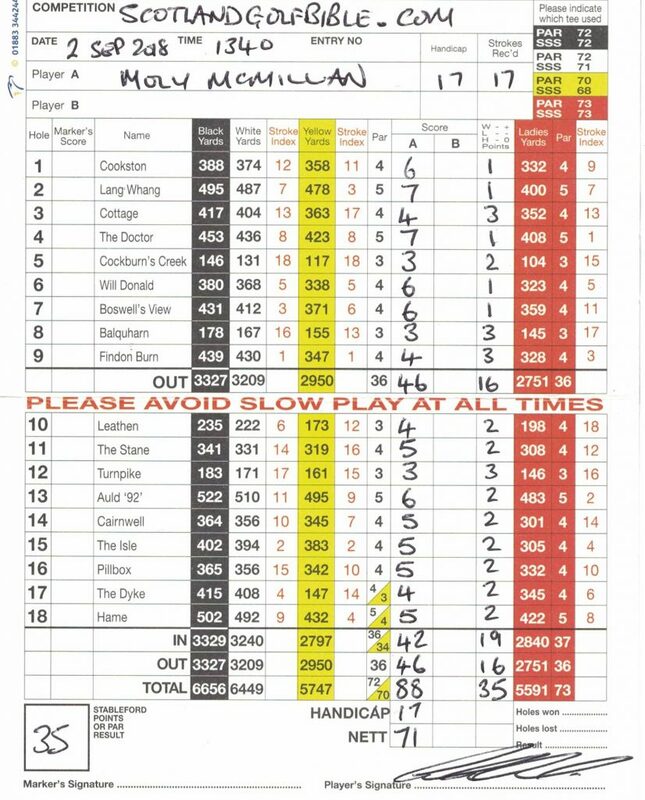 Moly’s Portlethen 88, with only 1 lost ball – which was the best strike of the day, including direction! 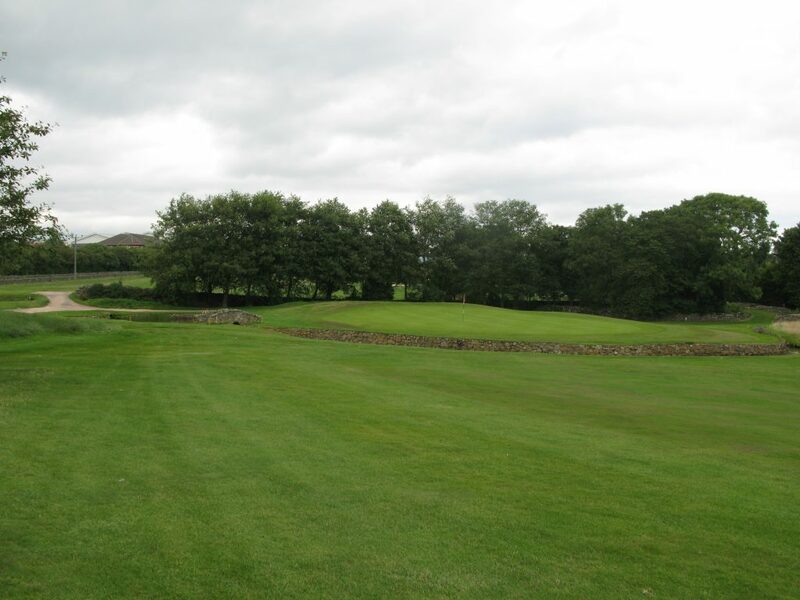 This entry was posted in 18 holes, 1946 - 1999, 3 star, 3 star, Aberdeen City and Shire, Course Architech, Course Owned By, Course Quality, Course Type, Donald Steel, Holes, Members, Overall Value, Parkland, Price, Region, When Course Established, £40 - £59. Bookmark the permalink.